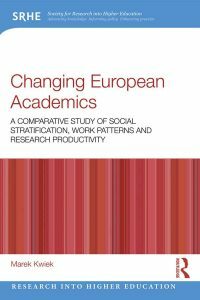 Marek Kwiek is publishing a new monograph: „Changing European Academics: A Comparative Study of Social Stratification, Work Patterns and Research Productivity” with Routledge (October 2018, 304 pp.). The book will be published in the SRHE „Research into Higher Education” Routledge book series (edited by Jennifer M. Case and Jeroen Huisman) in October 2018. The Routledge website for the book is here. The official Routledge preview for the book in PDF is here. Presents a comprehensive, cross-national picture of the changing academic profession in Europe and confronts academics across Europe. Academics from major European systems and beyond can view their own academic trajectories within the mirror of a larger, cross-national story. Discusses new dilemmas inherent to the changing social and economic environments of higher education. Will feed into a range of study programmes within the field of education policy and higher education policy. Relevant at both undergraduate and postgraduate levels and in both in Europe and beyond. Author is highly regarded research and is internationally recognised. European academics have been at the centre of ongoing higher education reforms, as changes in university governance and funding have led to changes in academic work and life. Discussing the academic profession, and most importantly, its increasing stratification across Europe, Changing European Academics explores the drivers of these changes as well as their current and expected results. A thoughtful and comprehensive study of the changing academic profession in Europe, this book will be of interest to higher education practitioners, managers and policy makers, both in Europe and globally. Changing European Academics will benefit anyone whose work relates to changing academic institutions and changing academic careers. The book is needed for several reasons. First, European academics have been at the very centre of ongoing higher education reforms in most European countries. Changes in university governance and funding have led to changes in academic work and life. Traditional theories of social stratification in science do not suffice to explain the directions of ongoing changes as viewed from a cross-European empirical perspective. Academics are in the eye of the storm, and this book shows selected dimensions of the drivers of change and their current and expected results. Second, only in the last decade did it become possible to study the academic profession – their academic attitudes, behaviours and perceptions – from a comparative European perspective. Until recently, it was difficult, if not impossible, to present a comprehensive cross-national picture of the changing academic profession in Europe. Most studies were single-nation, and most published research on the academic profession was country-specific, with chapters being devoted to academics in the context of various aspects of changing university governance and funding. Third, this book is needed because it provides a panoramic view of the European academic profession, specifically the university sector, in eleven national systems (Austria, Finland, Germany, Ireland, Italy, the Netherlands, Norway, Poland, Portugal, Switzerland and the United Kingdom). Until recently, gaining such a perspective was possible only at a very general level. The quantitative background is 17,211 questionnaires returned across Europe, and the qualitative background is 400 semi-structured in-depth interviews conducted across Europe as part of the global CAP and European EUROAC projects on the academic profession (“Changing Academic Profession” and “Academic Profession in Europe: Responses to Societal Challenges”, respectively). Third, this book is needed because it confronts misconceptions of academic work and life with compelling results and detailed analyses performed on large-scale primary empirical material collected across Europe. It asks traditional research questions in new empirical contexts, and it also asks entirely new questions that are pertinent to the changing conditions of academic work. Finally, this book is needed because it confronts academics across Europe with new dilemmas inherent to the changing social and economic environments of higher education, as seen in extensive empirical material. Academics from major European systems and beyond can view their own academic trajectories within the mirror of a larger, cross-national story.